Search all Waterfront Homes for Sale in Windermere Florida. Find Windermere Homes on Butler Chain of Lakes, Windermere Lakefront Homes, Windermere Waterfront Real Estate & more! Welcome to the Windermere Florida Homes for Sale Showcase. Sterling Chase Realty features Windermere as one of the top ten places to live in Central Florida. Windermere is located just minutes for Orlando and is very close to all the theme parks including Walt Disney World, Universal Studios and Sea World. Windermere offers it residents some of the best shopping, fine dining and golf courses in all of Central Florida. 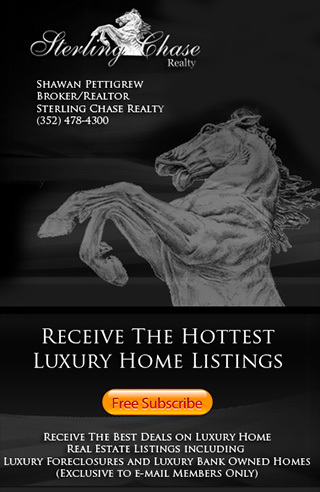 Sterling Chase Realty offers our buyers direct access to the Windermere MLS, here you can search Windermere Homes for Sale, Windermere Real Estate, Windermere Golf Communities, Windermere Waterfront Homes, Windermere foreclosures & more! If you have questions about Windermere or would like to know more about buying a Windermere Waterfront Home please call us at (352) 404-4622.